금탑사괘불탱은 옆으로 긴 폭에 삼세불과 주요 협시보살을 그린 독특한 화면구성을 이루고 있는 괘불이다. 크기는 길이 506㎝, 폭 648㎝로, 사천왕 등의 권속을 배제하고 주요 협시보살만으로 구성된 간략한 구도를 보여주고 있다. 삼세불은 화면을 가로로 3등분하여 큼직하게 그려져 있고, 상단과 하단으로 권속들이 배치되어 있다. 본존은 원만한 얼굴에 귀·눈·입·코 등이 작게 표현되었고, 머리에는 상투 모양의 육계가 옆으로 퍼져 있으며, 정상계주가 큼직하게 묘사되었다. 어깨는 각이 지게 표현되어 있으며, 발목에는 치견(侈絹)이 장식되어 있다. 괘불탱을 보관하고 있는 괘불궤는 1697년에 제작된 것으로, 괘불보다는 약100여년 전에 만든 이른시기의 것이다. 조선 정조 2년(1778년)에 비현과 쾌윤이 함께 그린 이 그림은 작은 이목구비의 표현, 옆으로 퍼진 육계에 큼직한 정상계주, 각이 진 어깨, 발목의 치견장식 등에서 18세기 후반기의 특징을 보여주는 중요한 자료로 평가된다. 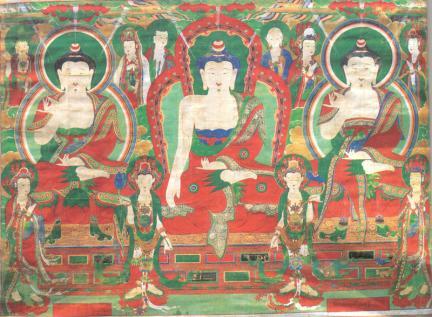 This is a unique piece among its kind, with the Buddhas of Three Periods flanked by major attendant bodhisattvas in a simplified composition portrayed in a horizontally long canvas. It measures 506㎝ (L) by 648㎝ (W). The Buddhas of Three Periods occupy most of the canvas, with the attendants placed in spaces below and above the three Buddhas. The main Buddha at the center shows small facial features in a round face, usnisa (a protuberance symbolizing supreme wisdom), and bead on topknot. He has square shoulders and silk fabric ornaments at the ankles. The casket used to store the hanging painting was made in 1697 or about 100 years earlier than the painting, which was completed in 1778 (the 2nd year of King Jeongjo’s reign) by monk painters Bihyeon and Kwaeyun. We can get a glimpse of the features of the paintings made in the late 18th Century through the small facial features, large-sized usnisa and bead on the topknot, square shoulders, and silk fabric ornaments at the ankles.